Unique and very elegant! 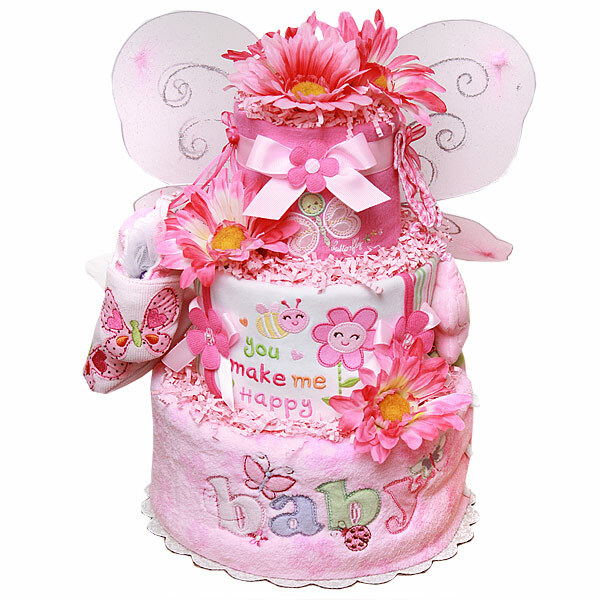 Three tiers "You Make Me Happy" Butterfly Diaper Cake is made of 40-45 Pampers Swaddlers diapers size 1-2 (8-15 lbs. ), Two flannel receiving blankets 100% Cotton, One super soft blanket, One bib; One flower baby toy by Koala Baby; One pair of baby slippers with butterfly; Butterfly's wings, lots of bows and silk flowers.